Study Design: Prospective multicenter study. Objective: To analyze the effect of the Ucar convex rod rotation technique on coronal and sagittal correction in the treatment of Lenke type I adolescent idiopathic scoliosis. Summary of Background Data: Various common curve correction techniques were used in scoliosis. This report describes the efficacy of the global vertebral correction technique with convex rod rotation. Materials and Methods: A total of 28 consecutive patients with Lenke type I adolescent idiopathic scoliosis managed with Ucar convex rod rotation technique between October 2012 and September 2015 were included. The average patient age was 14.8 years at the time of surgery. Measurements of curve magnitude and balance were made on standing anteroposterior, and lateral radiographs were taken before surgery, postoperatively, and at the last follow-up to assess deformity correction, spinal balance, and complications related to instrumentation. Results: The average preoperative main thoracic angle was 64.8° and was decreased to 15.5° postoperatively. The average preoperative T4–T12 thoracic kyphosis was 19.6° and was improved to 24.8°. All patients had mildly imbalanced or balanced shoulders at the final follow-up. Conclusion: Correction rates in the coronal and sagittal planes were as acceptable as those achieved with conventional methods. Adolescent idiopathic scoliosis (AIS) induces geometric changes of the spine with rotational deformity in the axial plane, lateral deviation in the coronal plane, and lordosis or kyphosis in the sagittal plane. Excellent deformity correction can be achieved with pedicle screw instrumentation. Many curve correction techniques used in corrective posterior scoliosis surgery have been reported.,,,,,,,,,, Most of these techniques have described concave side manipulation.,,,,, These authors argue that the concave side should be manipulated before the convex side. If the procedure begins with convex manipulation, it increases the risk of vertebral malrotation, resulting in a worsened rib hump. Few studies have described convex side manipulation.,,, The aim of this study was to evaluate the effectiveness of the Ucar convex rod rotation (UCRR) technique using initial convex manipulation, and reported and named by Uçar in 2014. We aimed at proving its efficacy in the coronal and sagittal plane. A total of 28 patients (25 girls and 3 boys) with Lenke type I AIS who were managed with UCRR between October 2012 and September 2015 were enrolled in this study. The average patient age was 14.8 (range: 13–20) years at the time of surgery. Curve magnitude and balance were measured on standing anteroposterior and lateral radiographs were obtained before surgery, postoperatively, and at the last follow-up to assess deformity correction, spinal balance, and complications related to the instrumentation. Coronal balance was measured as the distance between the C7 plumb line and the central sacral line. The coronal main thoracic curve was measured using the Cobb method. Global sagittal alignment was evaluated through standing lateral radiograph. The distance between the vertical line drawn from the anteroinferior corner of the C7 body and the posterior superior corner of the S1 body was also measured as the sagittal balance. Thoracic kyphosis was measured from the upper endplate of T4 to the lower endplate of T12 on standing lateral radiograph. Radiographic parameters (Cobb angle/thoracic kyphosis/correction rates) and perioperative data were collected and analyzed. The minimum follow-up was 12 months, with an average of 27 (range: 12–47) months. All included patients were available for final follow-up. The preoperative coronal plane main Cobb angles were 64.8°, which improved to 15.5° at the last follow-up. 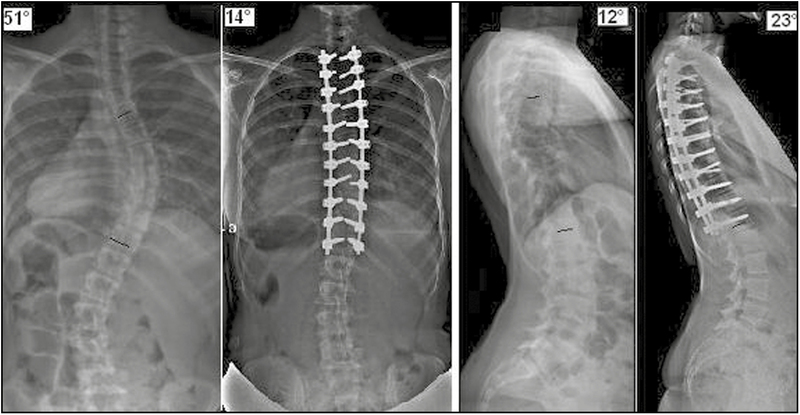 At the final follow-up, a 76.1% scoliosis correction was shown. Thoracic kyphosis increased from 19.6° to 24.8°. It was indicated that hypokyphosis returned to normokyphosis postoperatively [Figure 1]. Postoperatively, all patients showed their baseline neurologic status. No complications were observed in the patients both postoperatively and at the final follow-up. Currently, various common curve correction techniques are used in AIS. The previous correction techniques were discussed in chronological order in the Discussion section of the first report of UCRR as written by Uçar. During corrective surgery, it has been believed that convex rotation would result in a worsened rib hump and increase the risk of vertebral malrotation. Contrary to these views, recently published convex manipulation studies increases.,,, In 2012, Anekstein et al. treated scoliosis using a convex rod derotation maneuver. Yang et al. described a double-curve synchronous derotation with convex correction in 2014; Uçar also described his convex manipulation technique in 2014. Terai et al. reported a convex rotation technique using convex side manipulation in 2015. The common theme in all these studies is to begin to rotate the vertebral column from the convex side. No coronal and sagittal imbalance and vertebral malrotation have been reported. The most remarkable difference of UCRR, as first described by Uçar in 2014, is the order of screw placement. Convex manipulation studies involve rotating the convex rod after inserting screws on both sides. Although the screws are inserted to concave side first in all popular techniques, in UCRR the screws are inserted in the convex side as a priority. Second, the screws are connected with a rod contoured to the shape of the deformity. While the rod is rotating toward the convexity of the curve, a sagittal thoracic kyphosis and coronal correction are observed [Figure 2], [Video 1], [Video 2]. The rod is applied more easily on the convex side, and the pushing force can be applied for more correction. When the convex rod rotation maneuver was performed, the vertebral bodies rotate and concave side was screwed more easily, whereby it could be considered to shorten the surgery time. These are the advantages of initial convex side screw insertion and manipulation. The development of instruments allows for the manipulation of the convex side effectively. All recent convex manipulation studies showed that coronal and sagittal alignment were obtained successfully postoperatively.,,, These studies strengthen the argument for using this technique and provide evidence on current misinformation. Luque ER. Segmental spinal instrumentation for correction of scoliosis. Clin Orthop l982;13:192-8. Delorme S, Labelle H, Aubin CE, de Guise JA, Rivard CH, Poitras B, et al. Intraoperative comparison of two instrumentation techniques for the correction of adolescent idiopathic scoliosis. Rod rotation and translation. Spine (Phila Pa 1976) 1999;13:2011-7; discussion 2018. Lee SM, Suk SI, Chung ER. Direct vertebral rotation: A new technique of three-dimensional deformity correction with segmental pedicle screw fixation in adolescent idiopathic scoliosis. Spine (Phila Pa 1976) 2004;13:343-9. Vallespir GP, Flores JB, Trigueros IS, Sierra EH, Fernández PD, Olaverri JC, et al. Vertebral coplanar alignment: A standardized technique for three dimensional correction in scoliosis surgery: Technical description and preliminary results in Lenke type 1 curves. Spine (Phila Pa 1976) 2008;13:1588-97. Ito M, Abumi K, Kotani Y, Takahata M, Sudo H, Hojo Y, et al. Simultaneous double-rod rotation technique in posterior instrumentation surgery for correction of adolescent idiopathic scoliosis. J Neurosurg Spine 2010;13:293-300. Huang Z, Wang Q, Yang J, Yang J, Li F. Vertebral derotation by vertebral column manipulator improves postoperative radiographs outcomes of Lenke 5C patients for follow-up of minimum 2 years. Clin Spine Surg 2016;13:E157-61. Chen J, Yang C, Ran B, Wang Y, Wang C, Zhu X, et al. Correction of Lenke 5 adolescent idiopathic scoliosis using pedicle screw instrumentation: Does implant density influence the correction? Spine 2013;13:946-51. Newton PO, Marks MC, Bastrom TP, Betz R, Clements D, Lonner B, et al. ;Harms Study Group. Surgical treatment of Lenke 1 main thoracic idiopathic scoliosis: Results of a prospective, multicenter study. Spine (Phila Pa 1976) 2013;13:328-38. Anekstein Y, Mirovsky Y, Arnabitsky V, Gelfer Y, Zaltz I, Smorgick Y. Reversing the concept: Correction of adolescent idiopathic scoliosis using the convex rod de-rotation maneuver. Eur Spine J 2012;13:1942-9. Yang J, Huang Z, Grevitt MP, Li J, Li F, Yang J. Double-curve synchronous derotation with convex correction: A new corrective technique for adolescent idiopathic scoliosis with double curves. J Spinal Disord Tech 2014;13:32-6. Uçar BY. A new corrective technique for adolescent idiopathic scoliosis (Ucar’s convex rod rotation). J Craniovertebr Junction Spine 2014;13:114-7. Terai H, Toyoda H, Suzuki A, Dozono S, Yasuda H, Tamai K, et al. A new corrective technique for adolescent idiopathic scoliosis: Convex manipulation using 6.35mm diameter pure titanium rod followed by concave fixation using 6.35mm diameter titanium alloy. Scoliosis 2015;13:S14.